For other uses, see Bindi (disambiguation). A bindi (Hindi: बिंदी, from Sanskrit bindu, meaning "point, drop, dot or small particle") is a red dot worn on the center of the forehead, commonly by Hindu and Jain women. The word Bindu dates back to the hymn of creation known as Nasadiya Sukta in Rig Veda. Bindu is considered the point at which creation begins and may become unity. It is also described as "the sacred symbol of the cosmos in its unmanifested state". Bindi is a bright dot of red colour applied in the center of the forehead close to the eyebrow worn in Indian Subcontinent (particularly amongst Hindus in India, Pakistan, Bangladesh, Nepal, and Sri Lanka) and Southeast Asia among Bali and Javanese Hindus. Bindi in Hinduism, Buddhism, and Jainism is associated with Ajna Chakra and Bindu is known as the third eye chakra. Bindu is the point or dot around which the mandala is created, representing the universe. Bindi has historical and cultural presence in the region of Greater India. Ajna chakra has two lotus petals dedicated to the sun, the other to the moon (e.g. light and dark, or male and female) merged at the center. Bindi and traditional head ornament with sun and moon pendants. Traditionally, the area between the eyebrows (where the bindi is placed) is said to be the sixth chakra, ajna, the seat of "concealed wisdom". The bindi is said to retain energy and strengthen concentration. The bindi also represents the third eye. 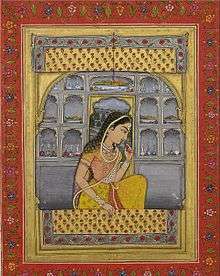 The Nasadiya Sukta of the Rig Veda, the earliest known Sanskrit text, mentions the word Bindu. The Ajna is symbolised by a sacred lotus with two petals, and corresponds to the colours violet, indigo or deep blue, though it is traditionally described as white. It is at this point that the two side nadi Ida (yoga) and Pingala are said to terminate and merge with the central channel Sushumna, signifying the end of duality, the characteristic of being dual (e.g. light and dark, or male and female). The seed syllable for this chakra is the syllable OM, and the presiding deity is Ardhanarishvara, who is a half male, half female Shiva/Shakti. The Shakti goddess of Ajna is called Hakini. In metaphysics, Bindu is considered the dot or point at which creation begins and may become unity. It is also described as "the sacred symbol of the cosmos in its unmanifested state." Bindu is the point around which the mandala is created, representing the universe. Ajna (along with Bindu), is known as the third eye chakra and is linked to the pineal gland which may inform a model of its envisioning. The pineal gland is a light sensitive gland that produces the hormone melatonin which regulates sleep and waking up, and is also postulated to be the production site of the psychedelic dimethyltryptamine, the only known hallucinogen endogenous to the human body. Ajna's key issues involve balancing the higher and lower selves and trusting inner guidance. Ajna's inner aspect relates to the access of intuition. Mentally, Ajna deals with visual consciousness. Emotionally, Ajna deals with clarity on an intuitive level. Buddha depicted with Ajna Bhrumadhya Bindu known as inner gaze. 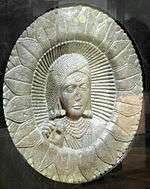 Bhrumadhya is the point in the center of the forehead commonly referred to as the third eye, or center of consciousness. In Hinduism, Buddhism and Jainism bindi is associated with Ajna Chakra and Bindu. Divinities in these religions are typically depicted with Bhrumadhya Bindu, in meditative pose with their eyes nearly closed show the gaze focused between eyebrows, other spot being the tip of the nose – Naasikagra. The very spot between the eyebrows known as Bhrumadhya is where one focuses his/her sight, so that it helps concentration. In South Asia, bindi is worn by women of all religious dispositions and is not restricted to religion or region. However, the Islamic Research Foundation, located in India, says "wearing a bindi or mangalsutra is a sign of Hindu women. The traditional bindi still represents and preserves the symbolic significance that is integrated into Indian mythology in many parts of India." Relief from Stupa, 2nd century B.C. As decoration only female figures were marked with sacred lotus during this period. One simple interpretation it is a cosmetic mark used to enhance beauty. From Vedic times, the bindi was created as a means to worship one's intellect. Therefore, it was used by both men and women. Worship of the intellect was so as to ensure that thoughts, speech, actions, habits and ultimately one's character becomes pure. A strong intellect can help one to make noble decisions in life, be able to stand up to challenges in life with courage, and recognise and welcome good thoughts in life. The belief was that on this a strong individual, a strong family and strong society can be formed. Red represents honor, love and prosperity, hence it was worn to symbolise these aspects. In meditation, this very spot between the eyebrows (Bhrumadhya) is where one focuses his/her sight, so that it helps concentration. Most images of Buddha or Hindu divinities in meditative pose with their eyes nearly closed show the gaze focused between eyebrows (other spot being the tip of the nose – naasikagra). Swami Muktananda writes 'auspicious Kumkum or sandalwood paste is applied (between the eyebrows) out of respect for inner Guru. It is the Guru's seat. There is a chakra (centre of spiritual energy within human body) here called Ajna (Aadnyaa) chakra meaning 'Command centre'. Here is received the Guru's command to go higher in Sadhana (spiritual practice) to the 'Sahasraar' (seventh and final chakra) which leads to Self-realisation. The flame seen at the eyebrow is called 'Guru Jyoti'. 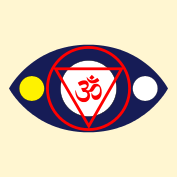 The encyclopedic Dictionary of Yoga informs that this 'Ajna Chakra' is also called the 'Third eye'. This centre is connected with the sacred syllable 'Om' and presiding, is 'Parashiva'. On activating this centre, the aspirant overcomes 'Ahamkar' (ego or sense of individuality), the last hoe on the path of spirituality. Bride with decorative bindis and maang tikka between hair parting where married women apply sindoor. Ornamental bindis were made and sold by Lac workers known as Lakhera. A traditional bindi is red or maroon in colour. A pinch of vermilion powder is applied skillfully with a ring-finger to make a perfect red dot. It takes considerable practice to achieve the perfect round shape by hand. A small annular disc aids application for beginners. First they apply a sticky wax paste through the empty centre of the disc. This is then covered with kumkum or vermilion and then the disc is removed to get a perfect round bindi. Various materials such as lac, sandal, 'aguru', mica, 'kasturi', 'kumkum' (made of red turmeric) and 'sindoor' colour the dot. Saffron ground together with 'kusumba' flower can also work. The bindi is no longer restricted in colour or shape. Historically, the ornamental bindi spangle consists of a small piece of lac over which is smeared vermilion, while above it a piece of mica or thin glass is fixed for ornament. Women wore large spangles set in gold with a border of jewels if they can afford it. The bindi was made and sold by lac workers known as Lakhera. In Hinduism it's part of the Suhāg or lucky trousseau at marriages and is affixed to the girl’s forehead on her wedding and thereafter always worn as a rule. Unmarried girls also wore small ornamental spangles on their foreheads. But before marriage it is optional and after marriage it's compulsory. A widow was not allowed to wear bindi or any ornamentation associated with married women. In modern times, self-adhesive bindis are available in various materials, usually made of felt or thin metal and adhesive on the other side. These are simple to apply, disposable substitutes for older lac tikli bindis. Sticker bindis come in many colors, designs, materials, and sizes. There are different regional variations of the bindi. In Maharashtra a large crescent moon shaped bindi is worn with a smaller black dot underneath or above, associated with Chandrabindu and Bindu chakra represented by crescent moon, they are commonly known as Chandrakor in this region, outside Maharashtra they are popularly known as Marathi bindi. In Bengal region a large round red bindi is worn, brides in this region are often decorated with Alpana design on forehead and cheeks, along with bindi. In southern India a smaller red bindi is worn with a white tilak at the bottom, another common type is a red tilak shaped bindi. In Rajasthan the bindi is often worn round, long tilak shaped bindi are also common, as well as crescent moon on some occasions. Decorative bindis have become popular among women in South Asia, regardless of religious background. Bindis are staple and symbolic for South Asian women. 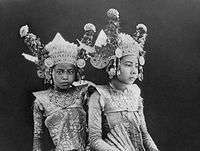 Balinese Hindu girls with bindi. In addition to the bindi, in India, a vermilion mark in the parting of the hair just above the forehead is worn by married women as commitment to long-life and well-being of their husbands. During all Hindu marriage ceremonies, the groom applies sindoor on the parting in the bride's hair. Apart from their cosmetic use, bindis have found a modern medical application in India. Iodine patch bindis have often been used among women in north-west Maharashtra to battle iodine deficiency. In Southeast Asia Bindis are worn by Balinese and Javanese Hindus of Indonesia. Historically, it was worn by many Indianized kingdoms in Southeast Asia. Ancient Chinese women wore similar marks (for purely decorative purposes) since the second century, which became popular during the Tang Dynasty. Common decorative design was of sacred lotus, most likely symbolizing Ajna. Bindis are popular outside South Asia and Southeast Asia as well. They are sometimes worn purely for decorative purpose or style statement without any religious or cultural affiliation. Decorative and ornamental bindis were introduced to other parts of the world by South Asian immigrants. International celebrities such as Gwen Stefani, Julia Roberts, Madonna, Selena Gomez and many others have been seen wearing bindis. The appropriateness of such uses has been disputed. Reacting to Gomez's appearance, Hindu leader Rajan Zed said that the bindi has religious significance and should not be used as a fashion accessory, but Indian actress Priyanka Chopra praised Gomez's choice as "an embrace of Indian culture". Alpana are the small decorative design over the eyebrows and cheeks used in marriage or festivals. Nandek is a term erroneously used to describe a bindi in Malaysia. It may contain pejorative connotations although not in most cases. Shyama Tara Attended by Sita Tara and Bhrikuti. India. ca. 8th century. Green Tara as Prajnyaparamita, ca. 11th century AD. 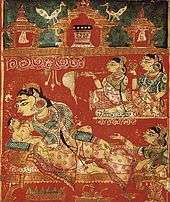 Kalpasutra Manuscript folio dated 1472. recto image of Trishala's grief. 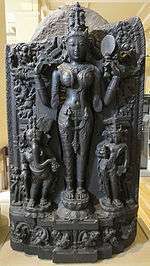 Goddess Lalita flanked by Gaṇeśa and Kārttikeya, Pala Dynasty. Hindu bride wearing Bindi and Groom with Tilaka. Bindi are often used as decoration or as a style statement. 1 2 3 Swami Ranganathananda (1991). Human Being in Depth: A Scientific Approach to Religion. SUNY Press. p. 21. ISBN 0791406792. 1 2 3 4 Mercier (2007). p. 267. ↑ Das, Subhamoy. "Bindi: The Great Indian Forehead Art". Retrieved 2009-02-16. 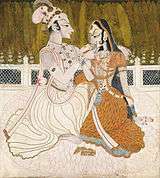 ↑ "Couples Fuel India's Vibrant Art Scene". The New York Times. 13 October 2011. Retrieved 2011-10-20. ↑ "Bindi: The Great Indian Forehead Art". About.com. Retrieved 2012-01-09. ↑ Gwynne, Paul (2009). World Religions in Practice: A Comparative Introduction. Maiden, MA: Blackwell Publishing. ↑ Dhar, Shobha (11 April 2015). "Iodine bindis for tribal women to fight deficiency". TNN. The Times of India. Retrieved 25 July 2015. ↑ "Legends about "Xiehong"". cultural-china.com. 24 June 2013. ↑ "Make-up tips of the women in the Tang Dynasty". cultural-china.com. 24 June 2013. ↑ "Svami Sadananda Dasa: Disciple of Bhaktisiddhanta Sarasvati and Guru of Vamandas (Walther Eidlitz)". sadananda.com. ↑ "'Pretty Woman' in temple upset". BBC News. 2009-09-23. Retrieved 2010-04-26. ↑ "Try a bindi now with Western wear". Punjab Newsline. 6 October 2011. Retrieved 2011-10-20. ↑ "Tony & Cherie Blair it well". The Sun. 7 Jan 2002. Retrieved February 15, 2012. ↑ "Cherie's sari starry night". The Sun. 21 May 2008. Retrieved February 15, 2012. ↑ "Bollywood dreams: Uma Thurman and Debra Messing sparkle in Indian dress as they film scenes for Smash". Daily Mail. February 2, 2012. Retrieved February 15, 2012. ↑ Sieczkowski, Cavan (April 16, 2013). "Selena Gomez Bindi: Hindu Leaders Demand Apology For MTV Movie Awards Costume". Huffington Post. Retrieved 2015-09-25. ↑ DelliCarpini Jr., Gregory (May 22, 2013). "Selena Gomez's Bindi Styling: Offensive? Bollywood Star Priyanka Chopra Talks About the Star's Usage". Billboard. Retrieved 2015-09-25. ↑ "Dazzling bindis". MSN India. 10 October 2011. Retrieved 2011-10-20. Wikimedia Commons has media related to Bindi. "History & Significance of Bindis". Retrieved 30 September 2013. "Bindis: Everything You Need to Know". Retrieved 30 September 2013.